Is it a duck or is it a rabbit? That is the entire premise of clever little Duck! 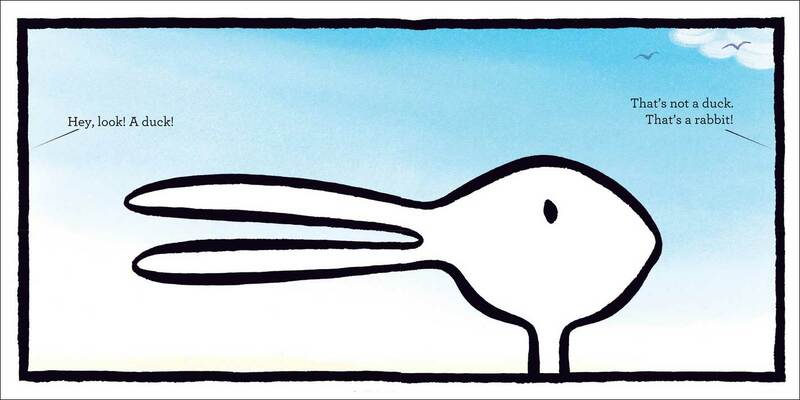 Rabbit!, which is narrated by two unseen voices, each taking an opposing viewpoint. 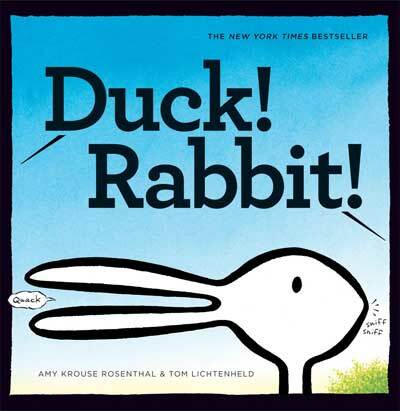 At the end, just as the two unseen narrators are starting to see each others' point of view, the duck/ rabbit is gone, a new ambiguous creature is shown, and the debating starts over again. This book is extremely simple in concept but so clever in execution! This is one book we can guarantee your kids will enjoy! 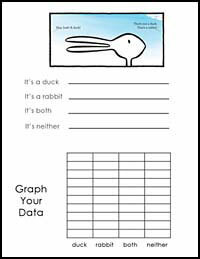 Graphing: While this book was not written for the purpose of teaching graphs, we have created a fun graphing activity to go with it. (See description below). Openmindedness: The "right" answer is never given, and your class/children will likely have differing opinions, making this is a great discussion starter for talking about how two people can think differently about something, and both be right. Duck! Rabbit! Lesson / Activity Ideas: Since this book includes different opinions, it's a fun book to use in a graphing activity. Read the book to your class just before recess, then send the kids loose on the playground with a copy of the following handout -- plus a clipboard, if you have them. Instruct students to ask other students' opinions and make a tally mark by their answer. (Or, do it just with your classroom students.) After recess, have the students count up the tally marks for each response and then graph the data. To get a large version of the flyer: click here. If you do this activity: Even if one animal wins over another one at your school, you probably want to talk a bit about how there really is no RIGHT answer, since that is kind of the message of the book...and a good message for kids to learn! 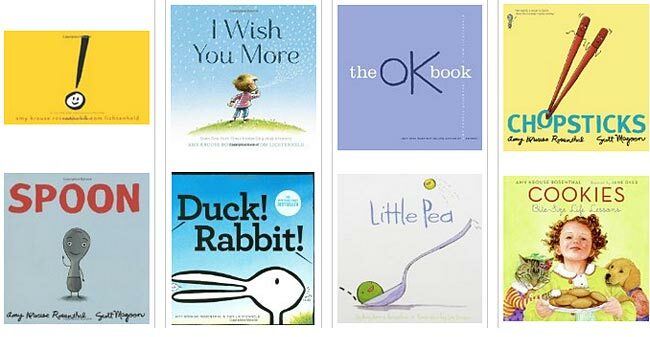 We LOVE Amy Krouse Rosenthal's books. They are adorable and funny, simple but clever. You must check them out!